Preorder today, to receive the launch edition (contains a skin and 10 wallpapers). The Disco Fever Edition contains as seen above. Coming Fall 2015. 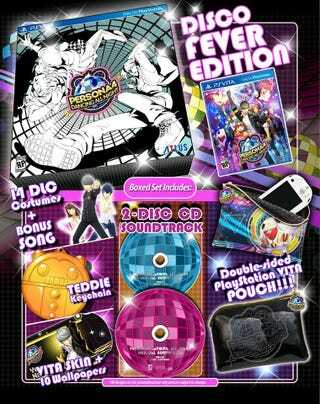 Persona 4: Dancing All Night, coming 2015 to the PlayStation Vita! Standard copy of P4 DAN will be $49.99/CA $59.99 both retail and digital. Disco Fever Edition will be $79.99/CA $99.99.